... inspiring oohs, ahhs and wows! Do you have an aviary in mind, but don't see it here? Providing large bird cages for our birds is a dream for many bird owners. Now Bird Cage Portal offers you an opportunity to provide your bird a beautiful, spacious and functional environment with our models of indoor and outdoor aviaries. We have aviary models in different styles, shapes, strengths and colors ... perfect for the smallest birds to the largest parrots. The dimensions of the many of the aviaries shown on this website work well as flight cages for the smaller birds. 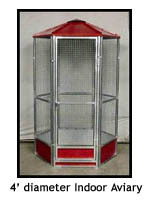 If you are in need of larger indoor or outdoor cages we may be able to help as custom sizes are available. For further information call (760) 723-8667. The width dimensions of our aviaries are measured from point-to-point where two panels meet. Veterinarians and pet bird behaviorists are startingto teach us something that we've known for years. The simple truth that it is exceedingly healthy for your pet birds to have an outdoor environment that they can thrive in for regular periods each day. In many cases, providing your bird a more natural environment has minimized or totally eliminated undesirable traits like feather picking and excessive screaming. The advantages of an outside environment for your bird is obvious. But how much simpler would your life be if your cage cleaning chores were cut by up to 80 percent? These modular outdoor aviaries will do that for you and more, even if your pets are outside for only several hours per day. They easily sit on existing decks, slabs, or inexpensive pavers from your local home improvement store. Simply hose down your aviary and PRESTO ... the clean up is done! 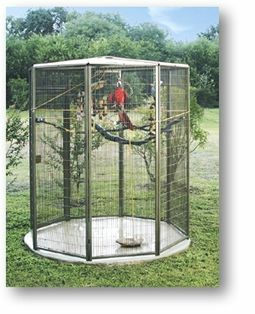 These standard bird and parrot aviaries are available in 3 sizes ... 4-foot, 6-foot and 8-foot diameters as well as 8 wire gauge and spacing choices accommodating small to large birds. Select the color of your choice for the roof and matching litter guard (for indoor models) from 6 beautiful colors. Frame and wire are powder-coated in black. The litter guard measures 12" from the bottom of the aviary. Amenities include excellent walk-in access with the full 3' x 6' door (except the 4' diameter hexagon which is narrower) and include key-locking door handles. Several welcome options are also available and if purchased with your aviary will save future shipping costs. The indoor aviary offers a split tray debris system which will fit under the grate or just as easily sit on top of the grate eliminating the need to clean the grate altogether. The behavior of your bird(s) will dictate which is most practical for you. Ease of maintenance is an important as providing a roomy environment. These aviaries can be placed on a piece of linoleum (or other protective material) and filled with your favorite bedding, such as CareFresh and then periodically sifted for cleaning. Using black/white printed newspaper, unprinted newspaper or other traditionally used paper covering also works well. Aviary assembly: These aviaries install with a clamp that allows panels to be easily assembled anywhere. With this Clamp Kit no tools are needed and parrots cannot disassemble them. The clamps make the assembly of the panels very strong, yet the structure can be easily assembled and disassembled if necessary. Clamp Kits are available that connect the panels at 90 degrees, 120 degrees, 135 degrees, and 180 degrees. Each clamp consists of two clamp halves, a carriage bolt, and a wing nut or a nylon lock nut. This makes it possible to assemble your aviary with few or no tools. However, assembly of the metal roof on the octagon aviaries will require a few tools. While some people view bird cages as a necessity or commodity with little attention given to the pet's point of view, we consider bird cages habitats. These indoor and outdoor bird cages will provide the space benefit for even large species while wire spacing as narrow as 1/2" accommodates the needs for smaller pet birds. Now you can easily convert that extra room inside into a bird paradise or make any patio or backyard a dream come true for your feathered friends. "Get a Grip" Climbing Grid ... your bird will love it!